Make no mistake: the verdict has transformed the strategic landscape. On July 12, an arbitral tribunal announced its verdict on the Philippines’ South China Sea case against China in a 500-page document. A week before at a China-U.S. dialogue in Washington on July 5, China’s former top diplomat Dai Bingguo proclaimed that the ruling would be “just a piece of trash paper.” In fact, the ruling is nothing short of a game changer. A game changer can be defined as a newly introduced factor that transforms the strategic landscape of a business. By changing the lay of the land, it reshapes the players’ strategies and identities and creates a strong incentive for them to adjust their courses. The game changer weakens the viability of some options and strengthens those of others, eventually altering the outcome of the game. The arbitral’s decision is reconfiguring the game nations play in the South China Sea in three main ways. First, it brings a great deal of clarity to the game and legally clears most of the South China Sea from dispute. At its core, the verdict includes several key judgments that help accomplish this. Perhaps most consequentially, it says that China’s “nine-dash line” has no legal basis and no country can lawfully claim “historic rights” in the sea. Beyond this, it also ruled that none of the features in the Spratly Islands can generate a continental shelf and an exclusive economic zone (EEZ), which may extend to 200 nautical miles (nm) from shore. Lastly, it decided that five features in the Spratlys, including Mischief Reef and Second Thomas Shoal, are “low-tide elevations,” reaffirming an earlier court ruling that low-tide features cannot be appropriated, by occupation or otherwise, and should belong to the continental shelf of its surroundings. With these key judgments, a vast swath of the South China Sea is legally no longer disputed. The ruling has in fact reduced the disputed area from more than 80 percent of the South China Sea to less than 20 percent of it. What remains under dispute is now only pockets of 12-nm radius circles from the disputed features, plus the overlapping areas of the EEZs from the mainland of the coastal states. By clarifying the legal status of most of the South China Sea, the ruling goes a long way in shedding light as to which actions were lawful and unlawful. For instance, the tribunal found that China’s construction of artificial islands in the Spratlys was a violation of Beijing’s obligations under the UN Convention of the Law of the Sea (UNCLOS) and that China was transgressing the law when it obstructed the Philippines from exploring for oil at Reed Bank, an area northeast of the Spratlys and well within the Philippine EEZ. China’s occupation of Mischief Reef, which began with allegations of “creeping assertiveness” by Manila in the 1990s, is also now undoubtedly illegal. Although the tribunal ruled only on issues between the Philippines and China, its judgments have implications for other actions in the South China Sea. In light of the ruling, it is now beyond question that Beijing has no legal basis to claim James Shoal, which lies 22 meters under the water and 43 nautical miles from the Malaysian coast, is China’s southernmost territory. The same applies to many other features that are submerged under water. Beijing’s opening of bids for nine oil blocks off the Vietnamese coast in 2012 would also be considered a breach of law should Hanoi bring the issue to court. Second, the ruling forces the major protagonists to take sides—to either be on the side of international law or against it—and significantly narrows the room for maneuverability for both its supporters and its opponents. Before the ruling, every state was advancing its own interpretation of the various South China Sea disputes and many were quick to deny they were taking sides. The verdict has now superimposed a more powerful and polarized two-sided configuration to all this. 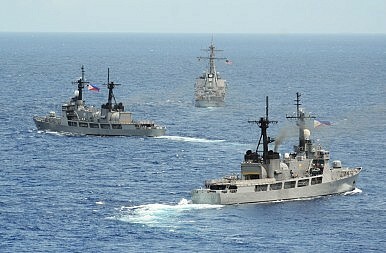 Every claimant and every user of the South China Sea now faces a pivotal choice: to accept the ruling or to reject it. Vietnam, for example, will have to drop its claims over the low-tide features that fall within the EEZ of the Philippines and Malaysia. This is the price it has to pay if it wants to enjoy the larger blessings of the verdict. China and Taiwan, in order to protect their own claims, have already solemnly declared their rejection. If they continue to refuse to accept the ruling in reality, they will have to endure the costs of their decisions. The ruling also limits the options of those who support it and those who oppose it. This may facilitate negotiation among the verdict’s supporters, but it will make negotiation between its supporters and its opponents more difficult. After the ruling, Philippine President Rodrigo Duterte can no longer enter talks with China with a blank slate. If he offers a joint exploration on the basis that its site is Philippine EEZ, China will not accept it. But if he agrees to share the resources with China under the premise of “shelving disputes,” his agreement will certainly be ruled illegal by the Philippine Supreme Court. China’s preferred negotiation tactic of “shelving disputes and seeking joint development” now cannot be applied anywhere. Third, the verdict creates a solid foundation and a strong incentive for cooperation among its supporters to enforce it. The ruling’s major supporters will likely be states that share the same objective of preventing the South China Sea from turning into a Chinese lake. On the frontlines are Vietnam, the Philippines, Malaysia, Japan, and the United States. But the group also includes Australia, India, major European states such as France and Britain, and some Southeast Asian countries such as Singapore and Indonesia. Before the PCA ruling, the configuration of “everyone on his own side” prevented these states from engaging in robust cooperation to achieve their common goal. The United States, for example, was restricted by its self-imposed principle of not taking sides in territorial disputes between others. It was also very reluctant to acknowledge its opposition to the nine-dash line, although this Chinese invention was the main obstacle to Washington’s freedom of navigation. With the nine-dash line legally removed, the Philippines, Malaysia, and Vietnam now can lawfully invite Washington, Tokyo and New Delhi to help them in their EEZs while justifying their action as upholding international law. If cooperation among these states before the ruling could easily be seen as taking sides and ganging up against China, now it can easily be defended as a collective effort to maintain the international legal order. A popular view about the effectiveness of the ruling is that although it is binding, it is not enforceable, particularly when China is stridently against it. But law attracts its own followers and creates its own protectors if it serves their interests. Furthermore, the legitimacy of the verdict as international law and its alignment with the strategic interests of several key players in the region will create mechanisms for its enforcement. These mechanisms can take three main forms: diplomatic pressure, economic sanctions, and political and military counterbalancing. To be sure, diplomatic pressure will be insufficient to change China’s behavior. And economic sanctions against China are probably not viable and practically impossible. China has replaced the United States, Japan and the European Union as the largest trading partner of almost every country in Asia. No country will be ready to stop trading with its top trading partner. But it is at least clear that the prospects of a robust counterweight to China look much better now with the favorable decision. An international coalition to enforce international law could emerge should China continue to pursue historic rights within the nine-dash line and defy the ruling. This coalition does not need to be a military alliance the way NATO is. A dense network of bilateral, trilateral, and multilateral security partnerships that involve several major powers and pivotal states in the region and that have international law on their backs could also pose a formidable challenge to China’s power. In one stroke, a tribunal verdict has shifted the strategic landscape in the South China Sea. The ruling puts an end to the age of ambiguity that has characterized the game nations have been playing in the South China Sea for decades. It also creates the conditions for a more binary configuration of how states line up on the issue. Although the tribunal has no army to enforce its verdict, its decision has legitimacy. And those who directly benefit from the ruling will try their best to make it enforceable. Alexander L. Vuving is a Professor at the Daniel K. Inouye Asia-Pacific Center for Security Studies. The views expressed in this article are his own. Indonesia New North Natuna Sea: A Response to an Old China ProblemRescind China's Invitation to Join RIMPAC 2016 Before It's Too LateChina’s South China Sea Project Must Not SucceedG7 Foreign Ministers Issue Communique Addressing East & South China Seas, Connectivity, and MoreWho's Afraid of a Free and Open Indo-Pacific?